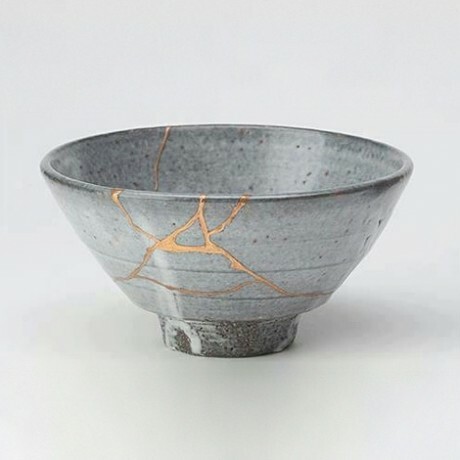 “Tea bowl fixed in the Kintsugi method” (Public Domain). Kintsugi is the Japanese art of fixing broken pottery with lacquer resin dusted or mixed with powdered gold, silver, or platinum. For years I operated under the unconscious assumption that recovering my essential unity with God was finding the pure, calm place inside me that nothing could shake. While this approach still calls to me, I now I think that recovering my unity looks more often like going directly to the most broken, hurting parts of me, noticing how they feel in my body, giving them love, and offering them up to what is sacred. It’s not a very comfortable or fun practice, but in the moments when I have managed to do it, I have never felt so alive. For those of us who speak a religious language, we can understand our journey of building shame resilience as one of the many ways we can uplift, exalt, praise, and honor not just our own lives but the Life of life itself. Whenever we feel unworthy of love and belonging, we can remember that the very self which we are struggling to believe is lovable is none other a manifestation of God’s own Self. Our belief that we are worthy to live and belong is one way we can practice our trust in God. And if the God language doesn’t do it for us, we can get in touch with our own wonder at being alive, call it whatever name or conjure whatever image works for us, and remember that our journey to live a wholehearted life honors that wonder. Ultimately we can affirm that any step toward a wholehearted life lifts up holiness in this world. 1. Rabbi Menachum Nachum Twersky (1730-1787) was the founder of the Chernobyl Ḥasidic dynasty. His work the Me’Or ‘Enayim is one of the foundational works of Ḥasidism. This selection comes from his commentary on parashat Yitro, Exodus 24:7. I have used the translation from Speaking Torah, by Art Green, Ebn Leader, Ariel Evan Mayse, and Or Rose (Jewish Lights, Woodstock, 2013). “סידור ולא נבוש | Jewish Prayer as Shame Resilience Practice: Siddur v’Lo Nevosh for Shaḥarit by Rabbi Shoshana Friedman” is shared by Rabbi Shoshana Meira Friedman with a Creative Commons Attribution-ShareAlike 4.0 International copyleft license. Please reciprocate for any adaptation or redistribution of this work by (1) properly attributing the work to Rabbi Shoshana Meira Friedman, (2) clearly indicating the date you accessed the resource and whether any changes have been made (and if so, please be in touch with us and leave a comment below so that we might note your adaptation or improvement), (3) providing a link back to this source, and (4) specifying the Creative Commons Attribution-ShareAlike (CC BY-SA) 4.0 International copyleft license under which this work was shared.